I’m very happy to report that I’ve had a much better start to this month’s game! The idea is based off the hypothetical situation most people contemplate at one point or another: your house has been broken into what do you do? At the moment the goal is to avoid detection from the robbers and escape before the time runs out. Obviously it’s pretty simple right now but I do have goals of adding more interesting elements as I go along – notably secondary objectives such as taking out the robbers or retrieving valuables. I’m happy with my progress thus far with player movement and robber waypoints both working pretty nicely (thanks go to Silly Hat Games for reminding of the magical iTween). I did originally plan to use the mouse for player movement and have kept that functionality for the moment but it felt too clunky given the nature of the game . The only thing bothering me now is the art style, which I would prefer to be cooler. I might have a play around with a blueprint looking colour scheme and see how that goes. 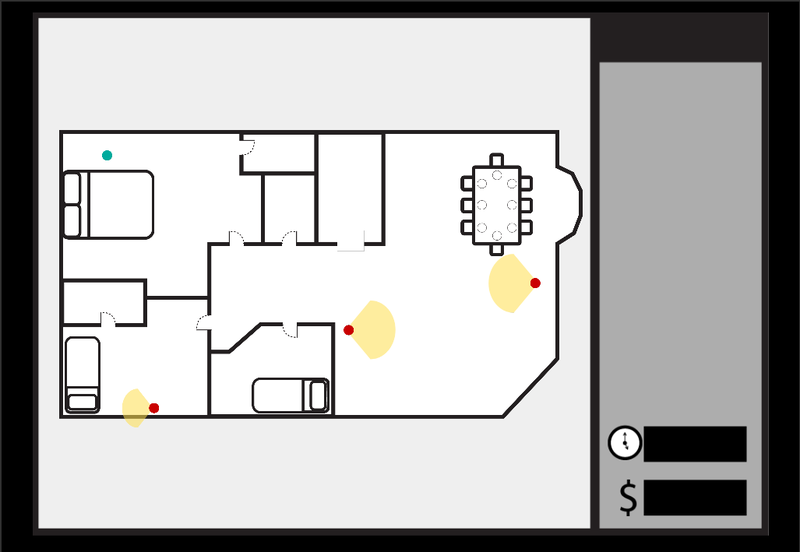 A picture may say a thousand words but I will add some more – The robbers will follow their paths, the player can move, collision is working and the robbers will detect the player should they get too close. Something that would be cool to hear from you guys it how you think you’d act if your house were robbed? Run for the nearest exit? Grab a weapon? Notify the authorities? I want to know, no matter how outrageous! 1GAM February – Two Down Ten to Go!